Every NBA team is looking for an upgrade to its roster with just two months to go in the season. For the Nets, that upgrade might come from within their building in the next couple weeks. 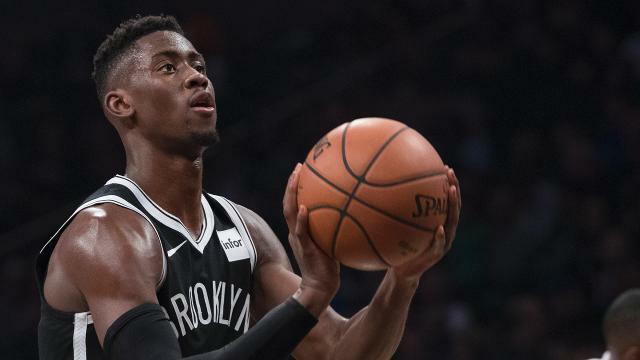 ESPN first reported that Caris LeVert is returning to 5-on-5 practice and could be slated for his first game back from injury before the All-Star break. Kenny Atkinson confirmed that LeVert returned to practice, initially working with the G-League affiliated Long Island Nets. LeVert has missed the last 41 games with a dislocated right foot suffered on a freak play Nov. 12 in Minnesota. The Nets went on to lose that game and fell to 6-8, seeing their playoff hopes potentially dwindling in front of their eyes. While the injury initially looked season-ending, the diagnosis of an ankle dislocation gave hope that LeVert would be back, even with a conservative rehab process. Now, that hope is quickly turning into reality. In between LeVert's injury and now, the Nets have undergone a transformation. They lost eight straight games, hitting a nadir of 8-18, before reeling off seven straight wins and running roughshod into postseason contention in the wide-open Eastern Conference. The team rebounded thanks to LeVert's backcourt mates, D'Angelo Russell and Spencer Dinwiddie. That duo's emergence helped stem the tide and make up for LeVert's injury. Both players took on more ballhandling responsibilities and opportunities. Therefore, it's fitting that LeVert's comeback would alleviate the Nets' problems brought on by Dinwiddie's injury. Dinwiddie's thumb surgery won't keep him out for nearly as long as LeVert, but his recovery comes during a crucial part in Brooklyn's schedule. So what will LeVert bring to the table in his return? It's easy to forget what he was able to do in the short period to begin the season. The NBA had begun to sing the 24-year-old's praises and considered him an early All-Star favorite. In 14 games, LeVert averaged 18.4 points, 4.3 rebounds and 3.7 assists. Alhough he was shooting just 31.1 percent from beyond the arc, his effective field goal rate had improved as he found his way to the rim with authority. His 58.3 percent field goal rate within 10 feet of the rim leads Brooklyn's non-centers. The 6-foot-7 wing became the go-to crunch-time player for Brooklyn, hitting a game-winning layup against the Knicks and a last-second floater to beat the Nuggets. Overall, he shot 61.5 percent in a small sample of clutch minutes, according to NBA.com. Defensively, the metrics didn't rate LeVert quite so highly as he put up a negative net rating despite the reputation as a future stout defender. Still, his length in the backcourt both allows him to guard multiple positions and challenge smaller guards. Keeping himself well-positioned on defense, he's second on the Nets behind Shabazz Napier with 2.8 deflections per 36 minutes. LeVert will undoubtably be rusty when he returns to the rotation. His efficiency that came with more experience may dissipate in his first few games while he gets acclimated. It may even take him until the 2019-20 season to be back to an elite level. He'll need to redevelop chemistry with his teammates and find where he fits next to Russell, Joe Harris and the team. LeVert may also come off the bench to begin his road back, as Russell did last season and Allen Crabbe did earlier this year. The larger question of how Russell, Dinwiddie and LeVert will work together once they're all healthy can be put off for now, though it will be a pressing question for the organization's future. The team had success to begin the year with all three in the rotation, yet it's not hard to see how each couold expect a larger role after their individual strides forward, thus creating a rotation dilemma. However, in the short term, LeVert is the backcourt addition the Nets need with their depth thinning. It's hard to expect his All-Star caliber start to the season to immediately carry over, but the Nets need him to get back to form if they're going to maximize their win total against a soft portion of the schedule. Will LeVert give Brooklyn enough to make the postseason? Perhaps. But getting him back on the court after November's gruesome injury is reward enough for now.